One might wish to ask the Secretary of State for International Development, the Foreign Secretary and the Secretary of State for Defence, all involved in making the decision to send UK aid to Nepal before the election, why UK’s offer of military Chinook Helicopters to support Nepal Humanitarian Aid has been rebuffed and the Chinooks are returning after weeks languishing at an Indian airport. It would appear that a significant amount of UK taxpayer money from the International Aid budget and the Ministry of Defence has been wasted due to incomplete, some might say incompetent, planning, and on a seemingly arrogant western ‘pushed-based’ aid response: you had a disaster, we know what is best, you obviously need what we are sending now we’ve organised ourselves to send something. Would it not have been far more intelligent (smart disaster response and support) to agree with Nepal a ‘pull-based’ aid response to ensure appropriate resources are sent that are actually needed and provided in a timely manner? In addition, that any equipment and aid provided has all relevant clearances agreed before being deployed, and its use already planned and agreed, so the assets can be put to immediate and effective use as soon as they arrive on site. It is puzzling why, despite initial UK military C-17 aircraft delivering aid to Katmandu being accepted, such valuable helicopter assets have not been enthusiastically embraced to support the enormous Nepalese post-disaster effort that is overwhelming this nation. A nation with such historically close ties to the UK. Especially in a land-locked country, where infrastructure is broken, roads, rail, electricity and water infrastructure has collapsed, and you have isolated communities that need to be assessed, accessed and supported, using large aircraft and helicopters to get aid to the country, and then distribute aid within the country, are the only way to provide this support effectively in the first days and weeks of a large disaster. In the first days of any major disaster, a priority is to do a rapid battle damage assessment from the air, then move big loads of shelter, clothes, food, water, medicines, comms, rescue resources (drills, diggers, generators, earth movers, rescue personnel) etc, very often and very quickly. Getting aid to survivors is essential in the first week to support the injured, provide the basics for survival and to reduce post-disaster medical and health deterioration and to minimise the spread of disease and suffering. Chinook helicopters are ideal to support these tasks and cover large areas of devastation, rapidly dropping off ‘rescue packages’. Without medium and heavy lift helicopters, using just a shuttle of small helicopters inefficiently uses time, aircrew hours, fuel, and effort, delaying the delivery of vital aid to remote locations. Allegedly, the potential problem was the significant downwash from the Chinook twin rotor blades injuring people and further collapsing unstable buildings. However, all helicopters have a downwash problem when flying close to people and buildings, and of course, the larger and more rotors the more downwash. That’s an issue for the intelligent and experienced aircrew flying the helicopters to manage when they get to site. Why is Nepal happy to use medium/large Russian MI-17s with their downwash problems, but not UK military Chinooks? Why is Nepal happy to use medium/large Chinese military helicopters with their downwash problems to support aid – but not UK military Chinooks? Why is Nepal happy to use US military helicopters and large twin-large rotor Ospreys with their downwash problems to support aid – but not UK military Chinooks? One has to ask why does Nepal welcome selected foreign support and use different helicopters for different situations, but not welcome valuable UK Chinooks? It is plain to see that large helicopters are being used to move large loads to open fields close to villages, and then take away patients as a return medevac, medium helicopters similarly, smaller helos for use to gain access to narrow valleys and to support small area access logs and medevac, etc, etc. Not using the UK Chinooks, or any UK military helicopter, because of downwash does not appear to be the real reason they were turned back. Could it be that national and regional Asian politics rules over naive UK foreign policy? Is there a growing anti-British sentiment around the world? Could it be a backlash to UK’s damaging interventions in the MENA and concerns over local reaction to British Forces in a country? Using civil helicopters as part of a more coordinated UK International Response Organisation might overcome this issue, but doesn’t change the fact they are British provided. It would seem that it is not the tools that are the problem, more that the problem lies with the hobby craftsman not preparing the work plan properly, not understanding the working environment, and not selecting the right tool for the right job. Thus, one must question the continuing Prime Minister and Foreign Secretary assertions that the UK still has a large influence in the world and ‘punches above its weight’. How embarrassing that Nepal, even with pressure from neighbours, has felt it necessary to refuse UK military aid and rebuffed its ‘Force for Good’ strategy. Mr Cameron, Mr Hammond, Mrs Greening and Mr Fallon, who all seem detached from the global Realpolitik of today, should note well – governments around the world are increasingly reticent about your support or intervention. So where does that leave the reality and credibility of UK’s claims regarding being a global player and influencer now – in the Premier League relegation zone? Is this the real story here? The UK has a national and international disaster coordinating response organisation, but, it is too slow in its response, poorly led and coordinated, dysfunctional, tribal, has no discernable strategy that links to wider UK National Strategy for international security and stability. It is in desperate need of a comprehensive overhaul and link to the bigger picture. UK international response is currently a loose association between DEC coordinating reactive charities and running reactive public appeals, with reactive government/DFiD response, managed by knee-jerk reaction infrequent COBR meetings, and a lack of National Security Council predictive and proactive coordination and governance. Little seems to have changed for the better and the UK continues to waste vast sums of its aid budget, divorced from the wider UK National Security and Stabilisation aspirations. Thus, the role and use of DFID as part of wider UK plc international strategy and influence must be included in the forthcoming reviews of the NSS, SDSR, NSC, etc, to ensure DFID, FCO and MOD understand their parts in the broader UK National Strategy, which is also yet to be articulated – “UK, our part in the world”. Bottom line, the return of unused/rejected Chinooks is not the story, nor a problem with the dedicated service personnel and equipment sent out, they are unwitting pawns in UK diplomatic, political and international disaster response failings. It is squarely the problem of a dysfunctional UK comprehensive all-of-government approach, a waning UK global influence, and total lack of articulated government and supporting departmental, strategy and supporting coordinated strategies and single focal point for government activity coordination. 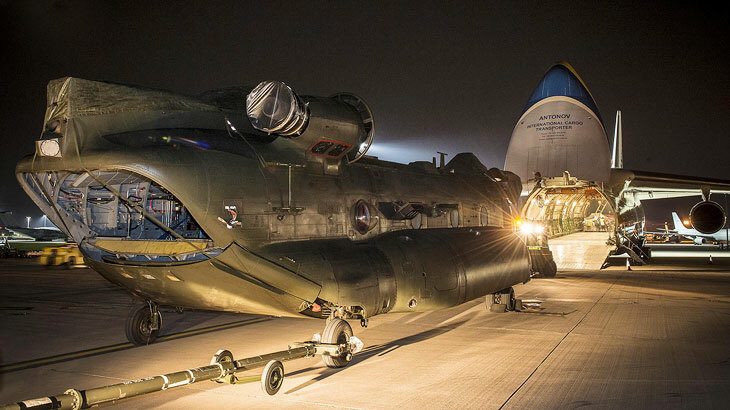 Image: A Chinook loaded onto a rented Antonov transport aircraft at RAF Brize Norton on 1st May prior to being flown out to India ready to support the aid mission in Nepal. Photo: DFID via Flickr.